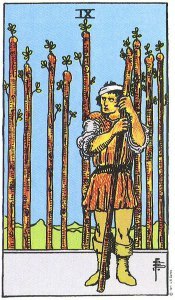 In the Nine of Wands- tarot card reading – hidden enemies are keeping you on guard! prepare to defend yourself. Be aware that there is a sense of anxiety here and an expectation of trouble on the horizon. This may be new trouble or the return of troubles from the past. Rest assured you do have supporters but it is hard to tell who is who right now. Patience and Perseverance wait and see what is really going on before you take any action or make accusations. Events from the past left you wounded and you still carry scars. The last thing you want to do is to expose yourself to potential hurt again but you cannot just sit back and do nothing. Think this one out clearly before you respond. You can’t show any signs of weakness. The Nine of Wands can refer to a situation that is not working out as expected. A lot of hard work and effort may have gone into it. You may feel like giving up and throwing the towel in but that is the last thing you must do. Patience and Perseverance will save the day. You must absolutely refuse to take no for an answer. Things may be tense at work. Try not to contribute to the tension; think before you speak, be calm and unruffled as possible on the surface, at least. Do your best and things will very likely be well. If you’re wondering if your job may be eliminated, unfortunately, the answer can be yes. This may symbolize the sole business owner who has to carry all the worries and responsibilities of the business on their own. Try to give your love one some space. If you are uncommitted, and longing for love, understand that the time may simply not yet be right for you. Don’t be in too much of a hurry. Anxious, Guarded, Wounded, Expecting Trouble, On Guard, On Duty, Experience, Showing Some Backbone, Wait and See, Patience, Perseverance, Strength, Force of Will, Conviction, Determination, Fortress, Defensive, Holding Back the Enemy, Battles, On-going Enemies, Patterns.